Legumes and pulses are rich in vitamins and protein. A staple ingredient in many regional diets, this food group offers a plethora of benefits. 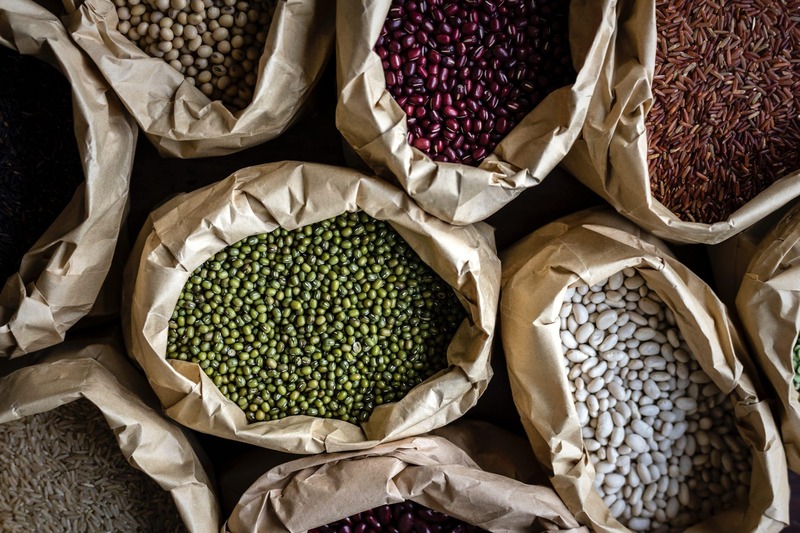 ProVeg looks at why legumes are such a healthy source of protein and other nutrients. Pulses are part of the legume family (any plants whose seeds grow in pods), but the term refers only to the dry edible seed within the pod. Beans, lentils, chickpeas, and split peas are the most common types of pulses. Peanuts, soya beans, and fresh beans and peas are legumes but are not considered pulses. On average, plant-based foods contain smaller quantities of essential amino acids compared to animal-based foods, with a few exceptions, including soya beans and hemp seeds.7Henkel J. (2000): Soy. Health claims for soy protein, questions about other components. FDA Consum. 34(3):13–15,18–20. 8 Mangels, R., Messina, V. & Messina, M. (2011): The Dietitian’s Guide to Vegetarian Diets (3rd edition). p. 71 However, the biological value of dietary proteins can be increased considerably by combining different protein-containing foods as the amino acids they contain complement each other.9Young, V. R. & P. L. Pellett (1994): Plant proteins in relation to human protein and amino acid nutrition. Am. J. Clin. Nutr. 59, p.1203S–1212S 10Marsh, K. A. et al. (2013): Protein and vegetarian diets. Med. J. Aust. 199, p.S7–S10 11Tomé, D. (2013): Digestibility issues of vegetable versus animal proteins: Protein and amino acid requirements – functional aspects. Food and Nutrition Bulletin. 34, p.272–273 Ideally, pulses should be combined with cereals, nuts, seeds, and vegetables, which can also be eaten throughout the day.12American Heart Association (2016): Vegetarian Diets. Verfügbar unter: www.heart.org/HEARTORG/HealthyLiving/HealthyEating/Vegetarian-Diets_UCM_306032_Article.jsp#.WdZOFdNJbBI [05.07.2018] 13Sanders TA (1999) The nutritional adequacy of plant-based diets. Proc Nutr Soc 58: p. 265–269 The digestibility of pulses’ plant-based protein can be significantly enhanced by cooking, chopping, or soaking them.14Mangels, R., Messina, V. & Messina, M. (2011): The Dietitian’s Guide to Vegetarian Diets (3rd edition). S. 69 A plant-based diet containing regular servings of pulses can provide more than sufficient protein. This is also true pregnancy or periods of strenuous physical activity, both of which require an increase in protein consumption. More and more people are questioning the consumption of meat and its effects on animals, the environment, and our health. This is reflected in the increasing demand for meat alternatives. Many supermarkets now offer a wide range of meat alternatives based on legumes.23Schmitt, S. (2017): Marktentwicklung: Das Sortiment wird breiter, In: Lebensmittel Zeitung Lebensmittel Zeitung vom 17.11.2017 Soya beans are used to produce tofu, tempeh, and soya meat, which are particularly popular alternatives to conventional meat. There are also numerous varieties of tofu, including smoked and marinated products flavoured with various herbs and spices. Soya meat (also called textured soya protein) is also available in various forms. Soya strips can be used for plant-based gyros or shawarmas, while soya mince is a great choice for chilli sin carne or veggie bolognese. Black bean burgers are a popular, healthy, and tasty alternative to ready meals and unhealthy fast food, while lupin protein is used to produce cutlets and sausages, among other things. Pulses are a healthy source of protein and a practical alternative to meat. Pulses and legumes, including lentils, beans, peas and lupins, as well as products made from them, such as tofu, soy milk, or tempeh, should be consumed several times a week. 7. ↑ Henkel J. (2000): Soy. Health claims for soy protein, questions about other components. FDA Consum. 34(3):13–15,18–20.